DNS (Domain Name System) is the most critical aspect of any network’s availability. When DNS services are halted, or slowed down significantly, networks become inaccessible, leading to damaging losses in revenue and reputation for enterprises. To ensure optimal network availability, many enterprises depend on top-tier managed DNS service providers for their external DNS needs. The basic “table stakes” characteristics of an enterprise-class managed DNS service are high reliability, high availability, high performance and traffic management. However, even the most robust DNS infrastructure is not immune to outages. Outages may be localized, in which only certain DNS servers in the network are not responding, or, less commonly, system-wide. A system-wide DNS failure can take an entire business offline - the equivalent of power failure in every one of their data centers. To prevent this, top-tier managed DNS systems have a great deal of built-in redundancy and fault tolerance, yet the danger of a single point of failure remains for enterprises that rely solely on a single-source DNS service. If no system of DNS is failure proof, this begs the question: what should an enterprise do about it? DNS availability statistics for managed DNS providers shows that the industry norm exceeds 5 nines (99.999%) uptime. This is the equivalent of about 5 minutes per year downtime. However, this top line number does not provide any detail on the impact of degraded performance, or the cascading effect of a system-wide outage of various duration, on individual enterprises. To discover the true impact of a potential loss of DNS availability, enterprises need to properly assess the business risk associated with relying on a sole source provider, and compare that with the cost of a second source DNS service. What would a 30-minute loss of DNS cost the business in terms of revenue loss, reputation damage, support costs and recovery? What does it cost to maintain a second source DNS service? Research amongst enterprises for whom online services are mission critical generally concludes that the cost ratios are in the range of 10:1 – one order of magnitude. Put another way, the cost of one outage is roughly estimated to be ten times the annual cost of a maintaining a second service. A business would have to have second source DNS for ten years to equal the cost of one major DNS outage. Looking at the odds and costs of outages, many enterprises are opting to bring in a second, or even a third, DNS service to hold copies of critical DNS master zones. 1. removing the danger of exposure to a single point of DNS failure. 2. reducing traditional master-slave DNS redundancy vulnerabilities, where slave zones can’t be changed if the master becomes unavailable. 3. improving infrastructure resilience by hosting critical zones with multiple providers, ensuring continued service availability and updates of changes if one DNS service provider becomes unavailable. This inability to view, synchronize and update identical zones’ data simultaneously can, in itself, lead to errors and conflicts in DNS configuration and result in a degradation of network performance, or even a network outage – the very events that multi-provider DNS redundancy is intended to prevent. 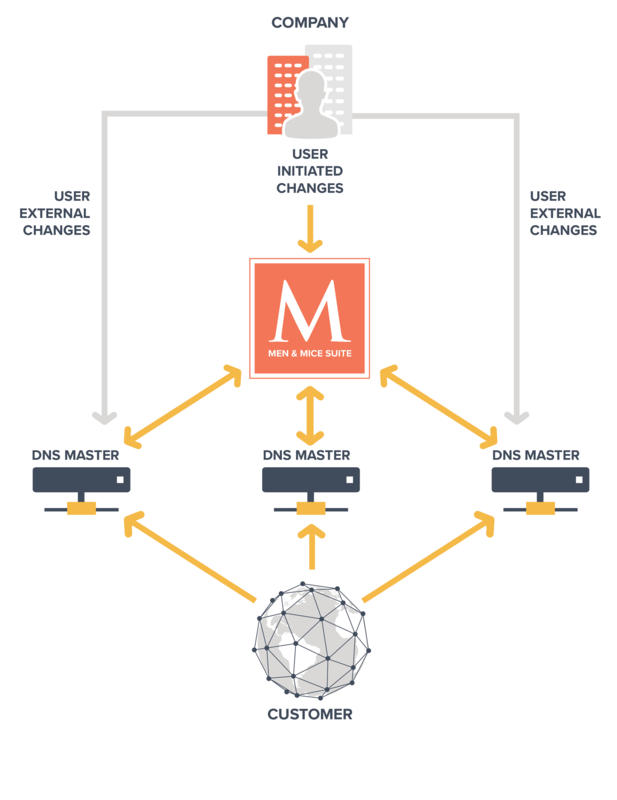 Breaking new ground in the battle against DNS disruption, the Men & Mice xDNS Redundancy feature provides the abstraction level necessary to replicate and synchronize critical DNS master zones across multiple DNS service provider platforms, on-premises, in the cloud, or in hybrid or multi-cloud environments. Men & Mice xDNS provides a unified view and centralized management of DNS data, regardless of the DNS service provider platform. Network administrators and other authorized users can use xDNS to perform necessary updates to their network’s DNS, as well as benefit from building automation with the powerful Men & Mice API, instead of having to dig around in different DNS platforms and deal with coordinating conflicting APIs. Combined with the flexibility of building automation on top of the Men & Mice Suite, xDNS offers you the freedom to better distribute your DNS load based on zone priority, performance requirements and accompanying costs. With xDNS, you are better equipped to steer the tiered price points of externally hosting, for example, critical high-performance or less essential low-performance zones, and utilize the DNS service best suited to your situation at a given time. Using the Men & Mice xDNS feature, create a zone redundancy group by selecting critical zones from DNS servers and services such as BIND, Windows DNS, Azure DNS, Amazon Route 53, NS1, Dyn and Akamai Fast DNS. Once an xDNS zone redundancy group has been created, xDNS assists the administrator in creating identically replicated zone content, resulting in multiple identical master zones. Additional zones can be added or removed from the xDNS group as required. All changes initiated by the user through Men & Mice, both the UI and API, will be applied to all zone instances in the group. All changes made externally to zones existing in the xDNS group, will be synchronized to all zones in that particular xDNS group. However, if DNS record conflicts arise, xDNS will alert the user and provide an option on how to resolve conflicts before the group is re-synchronized. If an xDNS zone is not available for updating, for instance if one DNS service provider experiences an outage, that zone will be marked as out-of-sync. Once the zone becomes available again, it will be automatically re-synchronized and will receive all updates that were made while the DNS service was unavailable. "Leveraging multiple managed DNS networks is the clear best practice for maintaining 100% uptime in today's rapidly evolving operational environment. 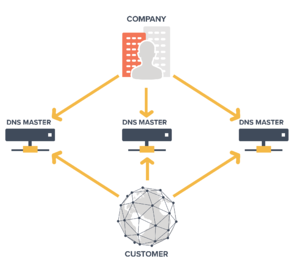 Configuring and operating multiple managed DNS services can be a complex, time-consuming process. NS1 is excited to partner with Men & Mice to help enterprises minimize management overhead and seamlessly enable redundant DNS. xDNS Redundancy is well-suited to enable multi-network DNS without the usual headaches." DNS redundancy is a great concept on paper, but a daunting challenge in practice. With xDNS, enterprises can seek out second, or even third source DNS services, confident in the knowledge that their DNS, and ultimately their business, will truly be safer that way. Magnus Bjornsson, Men & Mice CEO, considers xDNS an important step towards providing enterprises with greater, and more reliable, network availability. Men & Mice xDNS takes the ‘daunt’ out of maintaining external DNS redundancy, providing the centralized views and control necessary to reduce the risk of network exposure to a single point of failure, improve network reliability and performance and bolster the successful mitigation of DDoS attacks and other potentially harmful DNS incidents. To learn more about xDNS Redundancy, check out the xDNS webinar, jointly presented by Men & Mice and NS1.